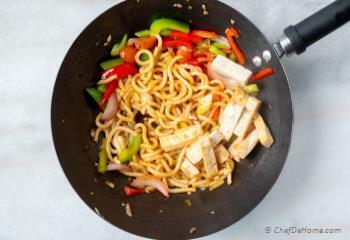 Quick and easy Tofu and Vegetable Stir Fry with caramelized Udon Noodles. Just 20 Minutes from Kitchen to Dinner table. 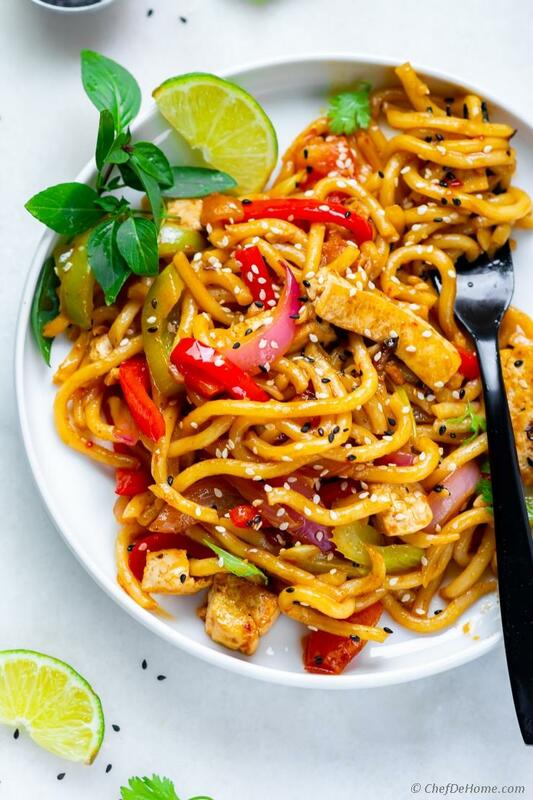 Say "Hello" to caramelized, umami, chewy noodle stir-fry with Udon Noodles, veggies, tofu and amazingly delicious, made-from-scratch stir-fry sauce. 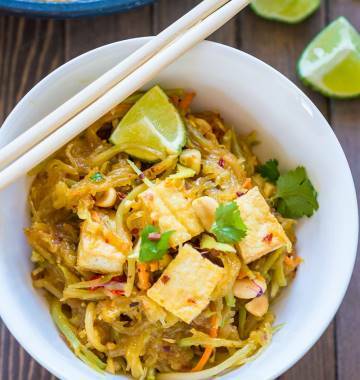 Super easy to put together for weeknight dinner and tastes better than Asian takeout! 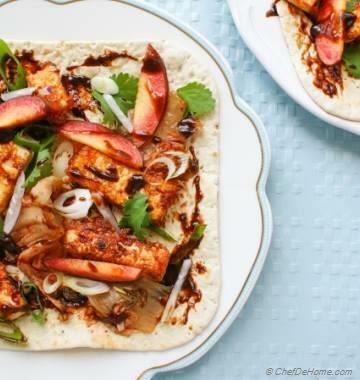 Replace tofu with your favorite meat for a main dish, or make as a side dish to your favorite homemade Asian dinner. This recipe works great either way. I used Tofu for a meat-free main course with serving of veggie protein. If you use meat, cook the meat until it is done to your liking. Chicken, shrimp or red meat, this recipe can be adapted to all. 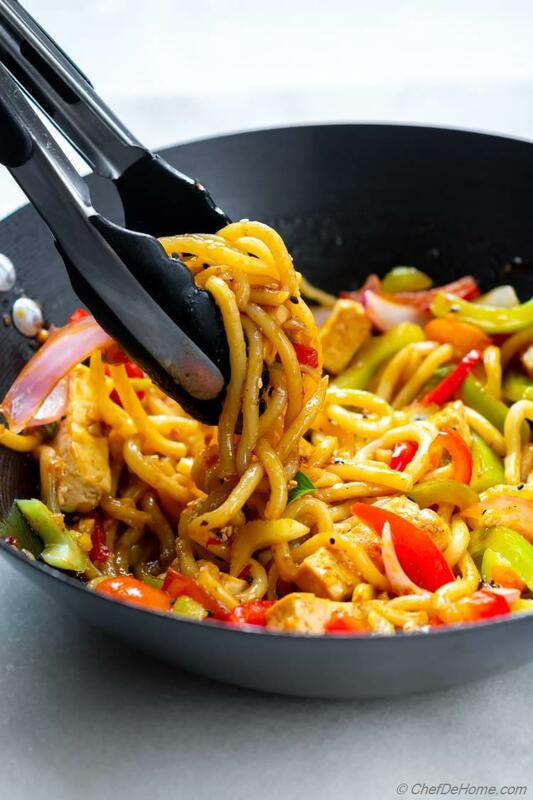 Tofu or Meat, this noodle stir fry takes less time to make at home than to order and wait for delivery. 20 minutes start to finish! Does this sound like a good dinner promise? So, let’s ditch the delivery and make scrumptious Stir Fry with Udon Noodles at home tonight! Udon Noodles are Japanese wheat noodles famous for thick, and chewy texture. These are often used in hot, rich-brothy soups. Fresh Udon Noodles are the most popular variety of Udon. These cook in an instant just like fresh pasta which is perfect for the Noodles Stir-Fry recipes. I specially like 7 Ounce Package of fresh Udon Noodles. If you wondering where to buy Udon Noodles? Look for Refrigerated/ Fresh Pasta Isle of any US Store. These are so popular in American Chinese cuisine that you will easily find it everywhere. Costco, Whole Foods, Walmart, VONS are to name a few. For rest part of the world, look in local Asian Grocery Store, or buy online here - Dried Udon Noodles, Fresh Udon Noodles. The base of a good Noodles Stir Fry starts with a delicious Stir Fry sauce. 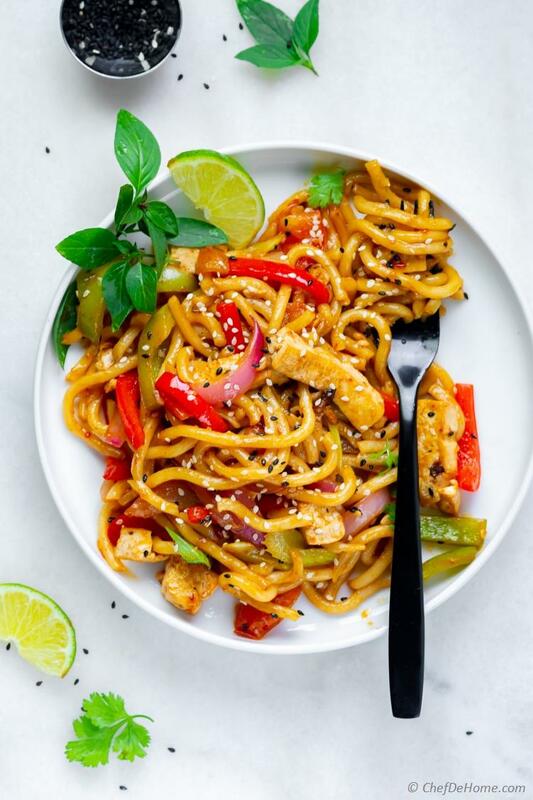 Sauce for this stir fry recipe is inspired from drunken noodles offered in most Thai restaurants. I stir fry silky Udon noodles in umami, sweet and spicy home-blended stir fry sauce until noodles have thick caramelized sauce coating. Today I'm talking about a homemade, made-from-scratch versatile stir fry sauce. 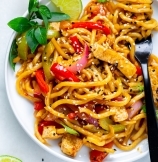 This stir fry sauce recipe is not limited just to this noodles stir fry. It is a versatile sauce that you can use for any stir fry. If you like Asian flavors, I'm sure you will have soy sauce, sesame oil, rice vinegar, and sambal chili paste (four quintessential Stir fry sauce ingredients) in your pantry. Other two flavor contributing ingredients in sauce are: oyster sauce and wine. Traditional stir fry sauce call for Mirin (a sweet Japanese Rice Wine). I cheat here a bit because I don't like hold a bottle of Mirin in my refrigerator just for cooking. White Wine. however, is often at home because we love drinking some with food. So, my simple substitute for Mirin is White Wine mixed with little bit honey. (if you have Mirin at home, feel free to use it. Instructions for both are included in the Recipe Notes). Honestly, making own sauce instead of buying a bottle makes so much sense. If you like to keep quintessential Stir fry sauce ingredients in your pantry. All that is needed is some wine and oyster sauce. In my experience, good Asian stir fry needs Oyster Sauce. 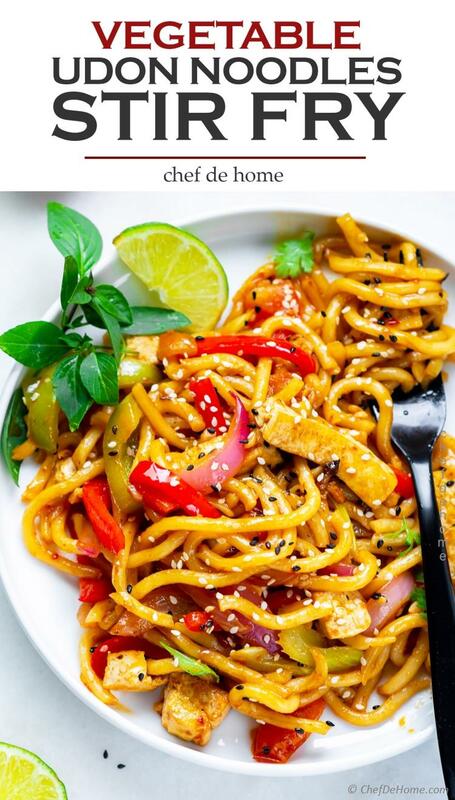 The flavor and color it gives to stir-fried noodles is simple amazing. If you looking for real delicious restaurant-style noodles stir-fry then I recommend investing in small bottle of Oyster Sauce. When you can't find or don't want to wait to get oyster sauce for this recipe, I also have few simple Oyster Sauce Substitutes. These will not taste 100% same but are very close cuisine. 1) Use equal part soy sauce and hoisin sauce (ratio 1:1). 2) Use 2 tbsp soy sauce, 1 tbsp honey, 2 tsp fish sauce with 2 tsp corn starch. Stir well. Heat for 1 minute. Mix well. Start to finish, it takes 20 minutes to make this stir-fry. You can even make stir-fry sauce up-to 1 week ahead. It may even keep longer, I usually end-up using it within week. Fresh Udon Noodles cook quickly. When I'm time pressed, I keep a pack of pre-cut veggies or slice veggies on weekend and refrigerate to use on weeknights. When ready for dinner, simply shallow fry your favorite protein. 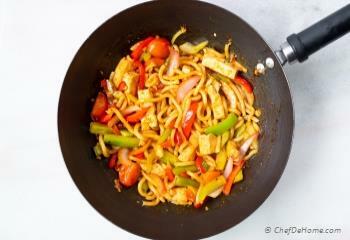 Add noodles, sliced veggies with stir fry sauce into hot sizzling skillet. 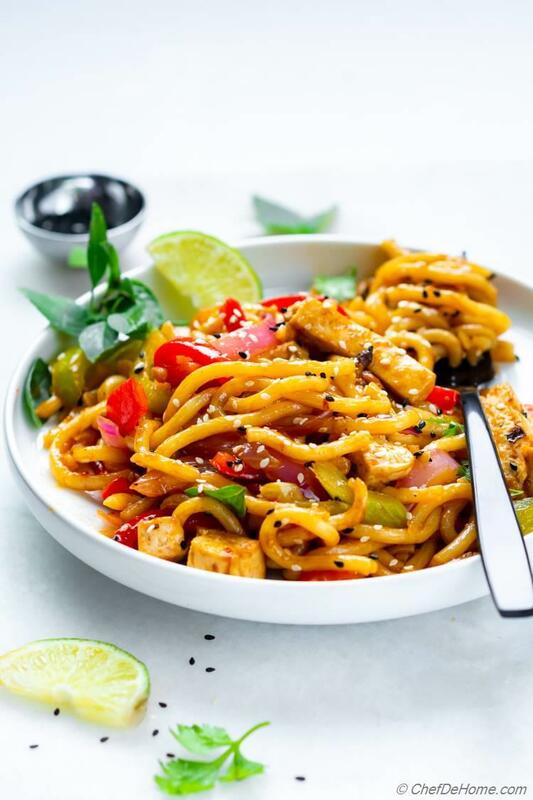 Stir-fry noodles with sauce until most liquid disappears and sauce clings to vegetables, tofu and noodles are slightly caramelized by pan frying. That's it. Finish stir fry with some fresh herbs such as Thai Basil and Cilantro. Add a splash or lime/lemon juice for bright citrus flavor. You have it. The ultimate, delicious Stir-Fried Udon Noodles with crisp-tender veggies and yummy tofu. Enjoy! Total Time 20 minutes Prep Time 10 minutes Cook Time 10 minutes Difficulty Easy Yields 3 Servings Serves 3 Notes No. of servings depends on serving size. 1. 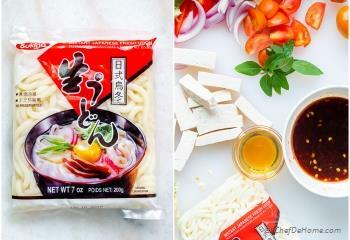 Soak noodles in hot water for 5 minutes or cook Udon Noodles according to the package directions. 2. Make Stir Fry Sauce: In meanwhile, mix stir fry sauce. In a small bowl, add all stir-fry ingredients. Mix well until honey mixes well with oyster sauce, vinegar and chili paste. Set aside. Slice all veggies and mince garlic. 3. Cook Tofu: Heat a part of oil (mixture of cooking oil and sesame oil - 1/2 tbsp cooking oil, 1 tsp sesame oil) in a wok/saute pan, add diced (pressed, drained) tofu with a tbsp stir-fry sauce, stir fry until tofu is light brown at edges. 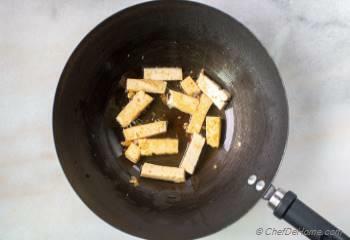 (careful of spatter) Remove cooked tofu into a bowl leaving behind any oil in the wok. 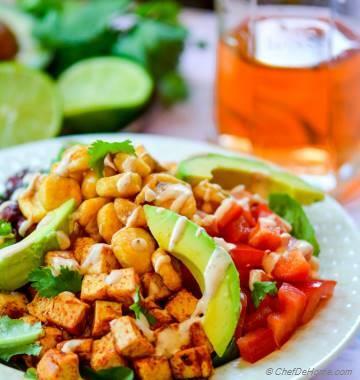 In this step, you can replace tofu with any favorite protein of your choice - chicken, shrimp. Dice small and stir fry until fully cooked. 4. Stir Fry Udon Noodles: In same pan, heat on medium-high, add remaining oil. Add garlic with veggies and stir-fry for 1 minute. Add drained udon noodles, stir-fry sauce. Cook on high heat until sauce coats the noodles (3-4 minutes) and noodles are bit caramelized. Add tofu, toss with noodles gently. Remove from heat. Add a tbsp lime juice with pinch of salt and pepper. Taste and adjust salt/lime juice. 5. Serve: Garnish with fresh basil, or cilantro (or both). Serve lime wedges on side for extra splash before eating. Enjoy! 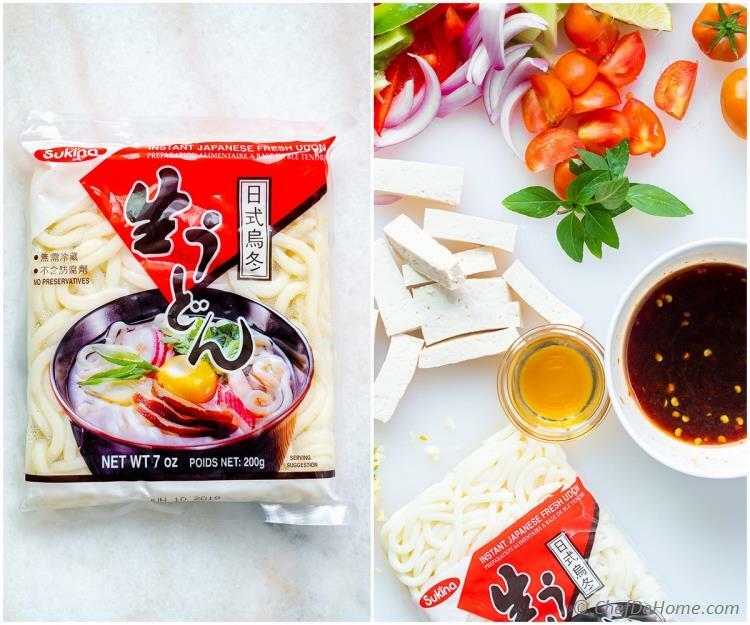 **Udon Noodles: I use 2 of 7 ounce Fresh Instant Udon Noodles package. These can be cooked with stir-fry, in steam of stir-fry sauce. For less messy results, Cover noodles in hot water for few minutes so these untangle, then add to sauce and stir fry. *Oyster Sauce Substitute: If you can't find Oyster sauce, use equal part soy sauce and hoisin sauce. It will not taste 100% same but flavor is very close.